Happy Monday! Hope you all had a great weekend. I introduced you to the laundry room awhile back, but I thought today I’d introduce you to the rest of the lower level. We’ll be sharing details on this space and the makeover as it evolves over the next few months, but I can give you a little overview of what we started with! One of the things we really like about our new (1950’s) house is the fact that it has a finished basement! But contrary to many of the basements we saw in other houses we looked at when we were house shopping, this one is spacious and filled with light from the backyard through several windows. The room feels bright and the ceilings aren’t too low, it has a white brick fireplace (with a gas insert) and an outside entrance (it’s a partially below the ground level basement, when you exit through the door you go up some stairs to reach the backyard). The previous owners finished this space years ago, but we intend to give it a cosmetic update (new flooring, blinds and paint, etc). As I mentioned in my post about the possible new “mudroom” upstairs, years from now we may turn all or part of our lower level into a rentable space. That would leave us with about 1500 square feet of living space upstairs and maybe a little bit more in the downstairs if we don’t rent out the entire lower level. But while our son is still at home (for the next few years at least) we want to use the lower level for family gatherings, guests, exercise space and possibly Luke’s bedroom. 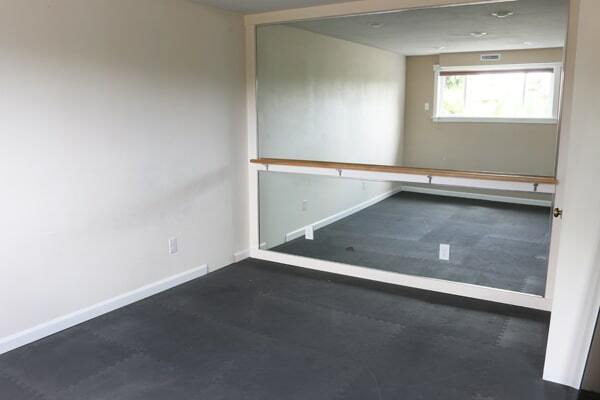 The easiest transformation for the time being will probably be to turn the current exercise space (pictured below, with the mirrored wall and bar) into a bedroom. The space by the exterior door could be a new exercise area, possibly with built-in storage. Then the large area by the fireplace would be for family, our TV and a pull-out sofa for guests. My dream is for white paneling downstairs as a finishing touch to add some texture and maximize the light and brightness we already have going on. A more open staircase would be nice, too. First step, though, will be to paint so we can start with a clean slate. I think I’m going to cave in and hire painters to paint the rest of our interior walls and trim throughout the house. I don’t want stretch the painting of walls out for years :). I think a painter is a splurge that will be worthwhile for us! I’ve started looking at window blinds to replace the pink ones and we are exploring various flooring options to replace the carpet. We sold our velvet navy sectional to the new owners of our old house, so we’ll be starting over with seating in this space. Recently I hung a mirror on the fireplace, ordered a rug and a new chair is on its way, so at least I feel like we are getting started! Sometimes that’s the hardest part. I’ll update again on this space in a few days so you can see how it is coming together, and follow along with the progress! I will also be ordering blinds for windows soon (and will let you know what I decide to order). 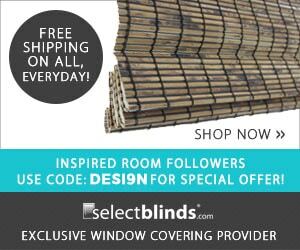 If you are looking for blinds for your home, below is a discount code and link that will get you the best discount and price from Select Blinds! I also have narrow steep stairs. Looking forward to seeing how you change yours. Do people really use exercise rooms? ? 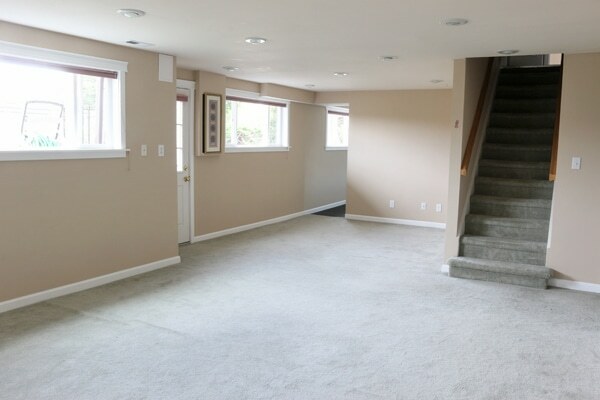 You are so fortunate to have such a lovely space for a basement! Best wishes with all of your plans. Yep, the investment of hiring painters to lay the perfect canvas for our home is one I’m resonating with, Melissa. We’re pretty sure the walls haven’t been re-done since the house was built 30 years ago. And I’m more than ready for white woodwork trim! I am interested in knowing what flooring you are thinking about for your basement rooms. We had a partially finished basement in our house and we carpeted one room we used for our daughter’s bedroom. Now we have two different floor coverings and I really don’t like either one. Thanks for keeping us inspired! We just redid the floors in our basement and went with a vinyl hybrid. It’s a floating click together, like laminate, but it’s totally waterproof. We went to several high end flooring places as well as bargain centers and it came highly recommended for basements in all places. It was a bit pricier than some of the other options, but I think worth it. If there’s any sort of water leak/flood you just pull it up and dry the water and put it right back down! That is such an amazing space, with so much potential! It’s great that it comes in good shape, too, so you can stick to cosmetic upgrades. I think it would be hard to give up the space to rent out (when it’s just so open and versatile) but having rental income is probably an amazing feeling too! I love all the light in your basement! What I wouldn’t give for some great natural light like you have! Your lower level is similar to mine, in my chalet style home. My girls have the lower level with a full bathroom that they share, laundry area, kitchenette, two doors with access to the garden (one slider, one standard door), a living space with pullout, separate bedroom, and my previous yoga space, also with a pullout….which my older daughter moved into when she moved home. The lower level was already finished when I bought my home, it just needed fresh paint….and it was a huge selling point for me! I don’t know what I would do without that separate space with two grown daughters at home! Looking forward to seeing what you do with your space….always a pleasure visiting your blog! Thanks, Debbie! It is a GREAT space for teens and grown kids! I’m pretty excited about it! I have an unfinished basement in our new home, so I look forward to seeing what you create! So many possibilities. Nice lower level with a lot of light, room, and potential–lucky you! I think your fireplace would look great clad in reclaimed wood. Good luck with that space! 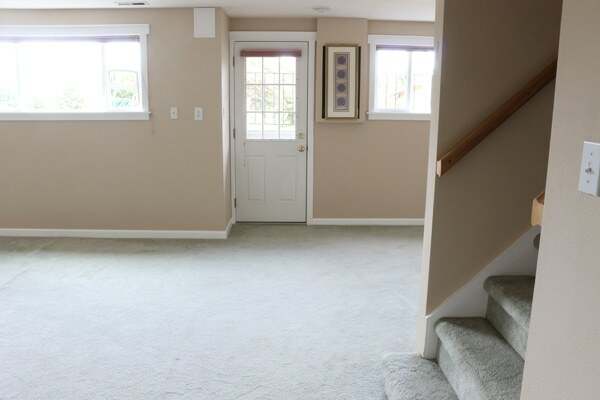 I can’t believe how light and airy it is for a basement. Nice to have that much light in the basement! I’m sure it is going to be lovely! Stretching out a painting job “for years,” is sooo a thing! Lol. Ha, glad I’m not the only one :). What a wonderful basement! Light filled and spacious. And the addition of white paneling for texture and to cut down on the light is a good idea. 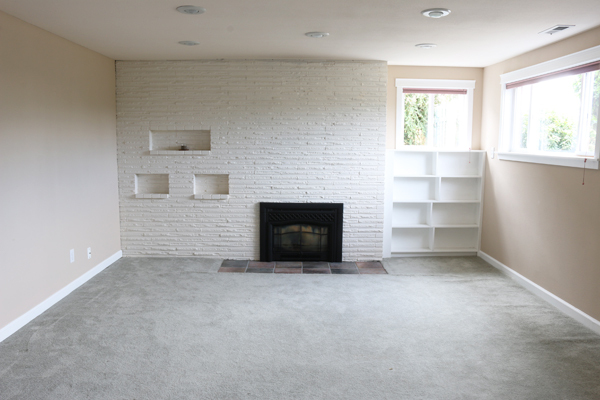 The finished basement adds so much more living space and the idea for the future for renting is wise. Thanks for the photos! I’m really enjoying your blog. Your lower level is exactly like mine! About 3 feet is underground and my windows look just like yours. Mine is a split-level built in 1968. 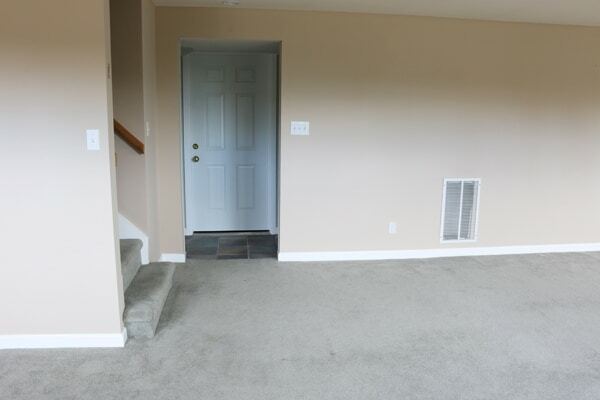 It was surfaced remodeled before we moved in, and even has the beige walls with white trim that you have! But we’re planning some additions make it much more functional (adding mudroom, pantry, better kitchen, bigger laundry, more light, 2 more bedrooms and baths). Currently 2 of our 3 br’s and 1 of our 3 ba’s is downstairs. ANYWAY, my lower level doesn’t have a door out. Could you please show me a picture of what is outside your door, what the steps look like to get up to ground level? I don’t remember, do you live in an area with snow?